Russia rules “hard life” in Uzbekistan as reason for the “unrest”. 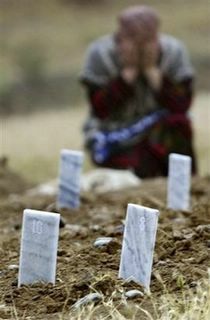 A woman cries near grave markers outside of Andijan, Uzbekistan. On Friday May 13th, 2005, Uzbekistan officials opened fire on demonstrators in Andijan. The Uzbek government put the death toll at 169; opposition leaders say more than 700 died. Uzbekistan has threatened the US with closure of its airbase in Tashkent if it does not stop critisizing the government for the Massacre in Andijan. The government of Uzbekistan has restricted American military flights from its soil in recent weeks, a Pentagon spokesman said Wednesday, declining to connect the change directly to the U.S. criticism of Uzbekistan’s violent response to unrest there. Uzbekistan has stopped allowing U.S. nighttime flights from its air base at Karshi-Khanabad, which American forces use to support operations and supply humanitarian aid to neighboring Afghanistan, Pentagon spokesman Bryan Whitman said. The U.S. military has come up with several workarounds to deal with the restrictions, Whitman said, without providing details. The U.S. military has access to other bases in the region. Uzbekistan opened the airfield to U.S. forces after the Sept. 11, 2001, attacks. Uzbekistan has refused to allow an international inquiry into its handling of last month’s uprising in the eastern city of Andijan. UN Human Rights officials arrived in Kyrgyzstan on June 15 to interview refugees who fled the violence in May. They are are hoping to gain an overview of the circumstances of the massacre where as many as 800 people may have been killed. Today President Islam Karimov blamed outside forces for the riots in Andijan.